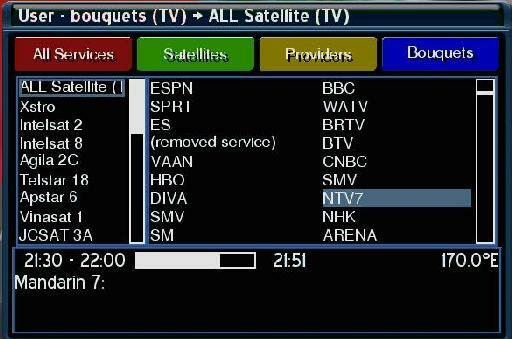 You may have hundreds of channels in your Dreambox satellite decoder and browsing them one by one may not be as friendly as you wish. Other than creating bouquets or favourite channels, there are actually some tweaks that you can try to make channel browsing much easier than usual. If you wonder how it works, the tweak actually utilizes the Help button on your remote control to display channel lists in full view, allowing faster access and switching to respective channels as desired. Access your Dreambox decoder from PC using FTP. Go to /share/tuxbox/enigma/resources/ and look for rcdm5xxx.xml file. Make a local copy to PC by dragging the file to your local directory. Save the new file into local directory and then transfer it back to Dreambox at /var/tuxbox/config/enigma/resources/. Do take note that this is not the original directory where you grab the rcdm5xxx.xml file initially. Restart the Dreambox satellite decoder and you are done. By now, whenever you are pressing on Help button, you will be able to view the channel lists in full with faster access and channel switching.